It's finally turned into t-shirt and shorts/skirts weather in England - how long it'll last is anyone's guess so I'm making the most of it! With more skin on show, I'm reaching for the fake tan to give me a safe and healthy looking glow. I've already tried all of the big name fake tan brands like St Tropez and He-Shi, so a brand new one I've been trialling recently is from the Irish brand, Karora. Their products feature pure active natural botanicals, some of which are organic and they don't tested on animals. I was kindly sent their Instant Tan to have a play with which is a super easy to use formula that washes off the next time you take a shower or a bath, so they're a great option for those who are new to fake tanning and want to experiment, or simply for people who are in a bit of a rush and just want something quick and easy to use before going out. 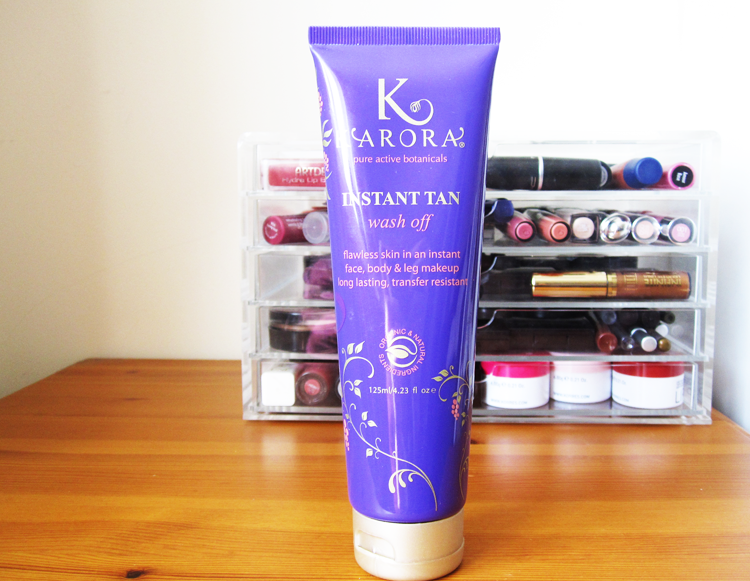 Karora Instant Tan comes packaged in a standard squeezy tube and contains ingredients such as Grape Seed Oil, Horse Chestnut Extract, Sweet Almond Oil, Macadamia Oil and Argan Oil to keep the skin happy and moisturised. It has a fresh scent and looks quite dark when it comes out, but once it's rubbed onto the skin, you're left with a very natural, golden glow. It does contain some shimmer particles which I personally didn't find too OTT, but it may be better suited for evening/night use, rather than everyday for some people. I found it easy to apply, it didn't stain my palms and it stayed put on my skin until I washed it in the next morning's shower. All in all, a good product to try if you're looking for a more natural alternative to the fake tan products currently on the market. Karora Instant Tan* (125ml, £14.66) is available from Baobella Boutique. Oh this sounds lovely! I am so fair that I do need a bit of a helping hand during the summer - may have to give this a whirl! Never heard of this brand before but it sounds really good, brilliant for unplanned nights out when you need to get ready at the last minute. I am so bad when it comes to Fake Tanning. I am always frightened that it goes very wrong. This tan sounds quite easy to apply, its not a brand Ive heard of before. I will have to check them out. I've never heard of this brand before! I'll definitely check them out! I love fake tanner during the spring because it gives me a nice healthy glow, haha! I'm always a bit wary of tan products but this one sounds lovely, and so moisturising! I've definitely been a bit paranoid getting my pasty white legs out since the weather has been so nice recently.